When the limit switch 1 is set, the indicator 2 ON 180ms (timer clocked). 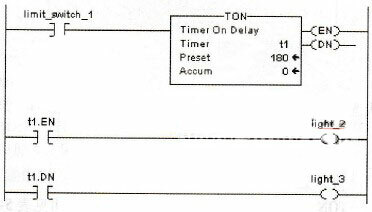 When the accumulated value of the timer 1 (.ACC) reaches 180, 2 lights off, the indicator 3 is turned on, and remains on until the TON instruction is disabled. If you disconnect the timer is timing the limit switch 1, then turn off light 2. This entry was posted in plc program and tagged Learn PLC programming, plc basics, plc courses, plc training, plc tutorial on August 10, 2016 by arco. * What is the meaning of PLC constant? * What is the meaning of Mitsubishi PLC constant H?